- many novel excuses for not going to school - "The front door won't let me out, Mum" or "The gate won't let go of my fingers, Mum." - a cat worried about starting school, who learns some amazing facts, saves the day with Seymour and looks forward to coming back to school! 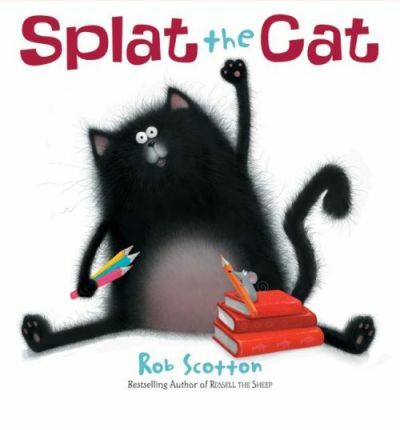 Rob Scotton, the author and illustrator, has created a very likeable character, who is a little anxious about starting school. My very likeable 8yo and 5yo characters drew some pictures of Splat with charcoal today. While I admire Scotton's incredibly detailed illustrations - look at the individual cat hairs on the cover! - I am equally awed by Tom and Annalise's 'smudged to perfection' charcoal cats!